I think this happens when lots of layers or the iPads available ram is getting low. Did you try closing the project (this performs a Save in AP). Then reopen and retry. If still crashing, try doing a hard reset on the iPad. 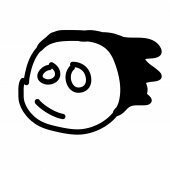 This releases ram. Press and hold power and home buttons until you see the Apple symbol on screen. Around 10 seconds. Had the same issue a few times. The work around might work, however doesn't seem a sound solution to me for this problem. I can imagine that on low ram memory Affinity Photo app takes action or at least gives a warning. I have the same issue and also upon exporting. I have already been doing the "work around". Problem is, I'm having to do it just about every other export. That's is not a fix. That is a headache that we shouldn't have to be doing every other export. Which version of Photo are you using? Since moving to beta, I can't recall crashing after using refine too. Other minor problems but refine seems fine. Had this happen too. Doing refine selection to change sky. Locked up twice. Had to shut down iPad Pro (12.9, 512gb), new, so I’m thinking Ram not an issue. Was able to do refine work in small sections, so perhaps it locks when doing a large area? I was going end to end with a wall photo, so not overly complex. Not a beta tester, just new to AP and iPad Pro. Devs are up to 1.6.7 rel candidate 2. I suspect a new store version is not too far off as most bugs identified in earlier betas appear to be resolved. Happens when the pencil leaves the edge of the picture. Normally doing a tiny section. We could not reproduce the issue with our sample files. Can you please upload the .afphoto and the original image to our Dropbox account? Still same problem and unable to upload problem file. 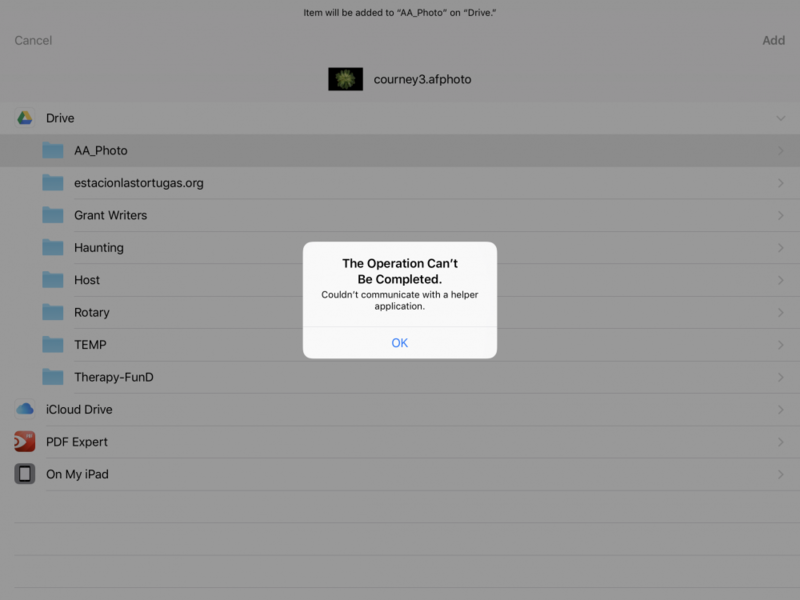 Getting error message which says “the operation can’t be completed” couldn’t communicate with helper application. Export also does not work to save to Drive but I can “share” to Drive. Any my help would be appreciated. Unfortunately I can’t upload the picture I was working on as it was for a friend. However I have tried it again on loads of other images and it doesn’t go wrong. i will have to try to find other people with white shirts and white backgrounds. Sometimes the file can get corrupted. Try saving your file without the history using menu/Save a Copy. Delete the file from the project screen (3bars menu and Close) then Open the Save a Copy version. When I try to export to google drive I get this error and I’ve tried several files. 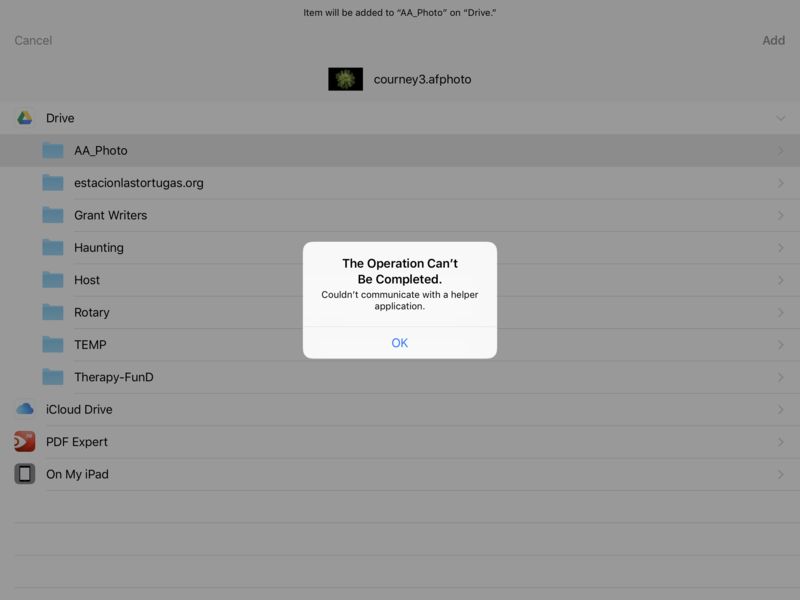 The error doesn’t give any clue if the problem is with affinity or apple. This happens to me almost everyday. For me at least... when I have around 15 - 20 layers, working about through each one, jumping out of one, into the other type of workflow, and accumulated hours (5-6 straight) this scenario, the OP expresses starts appearing for me. It doesn’t not come alone. I also get the marching ant line starts to disappear while it’s up. I have exit the file, then re-enter, and then there goes my marching ant line. These two two occur together hand in hand with me, if one occurs before the other - it’s already established, the other will pop up, just a matter of time. I'm on 11.2.6 and not experiencing any issues in AP. IOS beta is most likely the problem. iOS 11.3 has now been released. Not sure whether it is wise to update if the betas were causing issues. I’m still experiencing crash after crash even after I deleted AP and all docs related to it. So I started with a blank unused AP public release and still crashing. I cannot rely on AP to edit at all right now. But there is nothing that can beat it in the App Store. Any thoughts? That's unusual Michael. My AP app hasn't crashed for ages, but I have not updated to iOS 11.3 yet. What version of iOS are you running on the iPad? You previously mentioned iOS 11.3 beta. Are you still on the beta or the new 11.3 public release?